The types of workplace immigration investigations that can lead to operations like the one that took place at Zion Market in Kearny Mesa earlier this month have been surging recently. Federal immigration officials have massively ramped up their enforcement efforts in workplaces across the country over the last year. While certain aspects of immigration enforcement tend to dominate the news – arrests of longtime community members at their homes, or sending troops to the border – the government’s oversight of businesses and the workers they employ often flies under the radar. 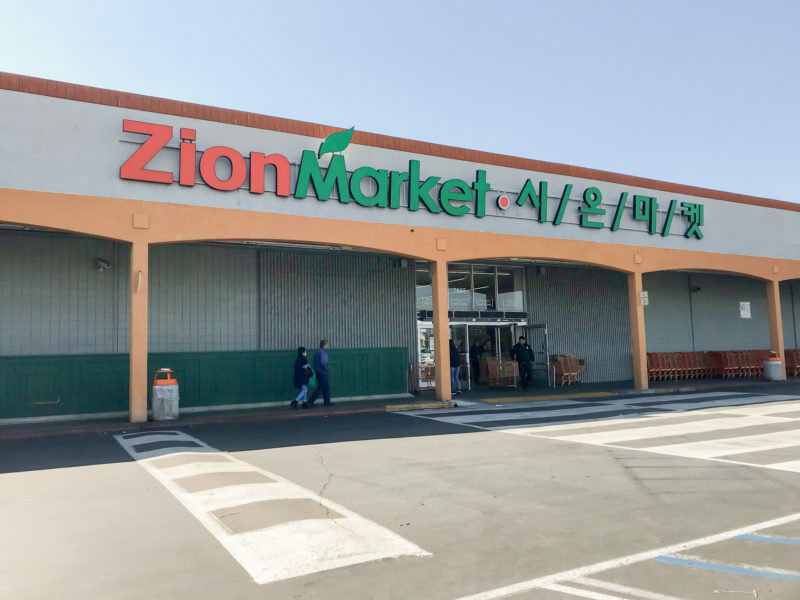 Locally, the crackdown on employers was driven home earlier this month, when Immigration and Customs Enforcement Homeland Security Investigations conducted an enforcement operation at Zion Market, a large Korean grocery store in Kearny Mesa. ICE officials detained 26 undocumented workers during the operation. Zion’s manager told Voice of San Diego he couldn’t comment on the operation, but told the Union-Tribune the day of the raid that officials detained mainly Asian and Hispanic workers. Homeland Security Investigations Special Agent in Charge David Shaw said he couldn’t comment on the specifics of the Zion case. The types of investigations and audits that can lead to operations like the one that took place at Zion Market have been surging recently. In fiscal year 2018, Homeland Security Investigations opened 6,848 worksite investigations. That’s roughly a 305 percent increase from the year before, when 1,691 investigations were opened. I-9 audits – random checks the government does to ensure that employees have proper work authorization – have also increased. In 2018, the government conducted 5,981 audits, compared with 1,360 the year before. The agency made 779 criminal and 1,525 administrative worksite-related arrests nationwide in fiscal year 2018, compared with 139 and 172 the year before. Administrative arrests are for non-criminal immigration violations. Despite the uptick in enforcement, though, criminal indictments and convictions have remained steady. In fiscal year 2018, there were 72 managers of businesses indicted over their hiring practices compared to 71 the year before, and 49 managers convicted in 2018 compared to 55 in fiscal year 2017. In San Diego, HSI agents opened 302 worksite investigations and initiated 282 audits in fiscal year 2018. They expect to initiate another 265 worksite audits in fiscal year 2019 in the San Diego region, according to a press release. The San Diego field office did not provide 2017 numbers. The primary form of worksite enforcement happens through something called a Form I-9. All employers in the United States must maintain Form I-9s for their employees. They contain basic information, like name, date of birth, contact information, but also information about an employee’s citizenship and their eligibility to work in the United States. Every year, HSI conducts randomized audits of companies’ I-9 forms to check for compliance. The audits can spur criminal investigations when it appears there may be a larger problem with an employer, as can tips to the agency about potential problem employers. “Really the goal for us is to find the employers who are taking advantage of the system,” Shaw said. Administrative audits often end in fines, said Kimberley Robidoux, an attorney who often works with companies on I-9 issues. Those fines can range from $110 to nearly $2,000 per employee. Sometimes errors are simply the result of a technical glitch or a paperwork error. Other times, an employee’s work authorization comes into question, which triggers an ICE “Notice of Suspect Documents,” which would require the employer to reach out to the employee in question so he or she can provide proof of work authorization in the country. “Sometimes individuals just don’t come back to work if they don’t have authorization or sometimes people have the authorization, but it maybe just wasn’t updated in the database if a person was naturalized,” Robidoux said. In fiscal year 2018, ICE Homeland Security Investigations initiated 5,981 I-9 audits nationwide, up from 1,360 the year before. For things to get to the criminal level, Shaw said, the agency often looks for employers who are broadly and knowingly disregarding the law. The Zion Market operation wasn’t particularly large. Federal agents detained 146 individuals at a meatpacking plant in Ohio in June 2018. In August that same year, immigrant agents arrested 159 people at a trailer manufacturing plant in Texas. But Robidoux said it was likely one of the larger operations in recent San Diego-area history. In 2008, a high-profile worksite operation at French Gourmet in Pacific Beach resulted in 18 employee arrests. The owner and pastry chef pleaded guilty to a misdemeanor and felony, respectively, and had to pay nearly $400,000 to the government, according to the Union-Tribune. In one of the biggest local cases, Golden State Fence Company’s founder and a vice president were sentenced in 2007 to probation and hit with large fines for knowingly hiring immigrants who were unauthorized to work in the United States. The company had to forfeit $4.7 million to the U.S. government, a total that represented “the amount of profit the government believed the company derived through its use of undocumented workers,” the Union-Tribune reported at the time. The company had been contracted by the government to work on parts of the border fence in 1997. During one of the worksite searches conducted by federal agents during that case in 2005, 16 employees were arrested, the U-T reported.